Treatment table ALVO Menuet 4-00 has been designed to support the patient during all surgical procedures and operations: general surgery, vascular surgery, endoscopy, neurosurgery, gynecology and urology. 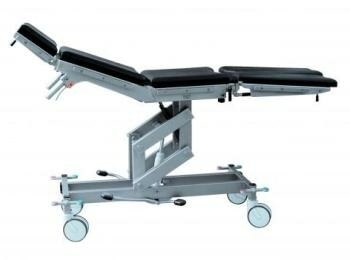 The mechanical operating table made of stainless, acid-proof steel, with sectional table top and mobile base equipped with mechanical central brake. Vertical adjustment is provided with hydraulic system driven by foot pump. Body elevator adjustment is performed by crank mechanism. Other functional movements - longitudinal tilts and table top sections adjustments are gas spring supported.